Mutiny Radio » Disturbing chart shows rise in “justified killings” of blacks in U.S. 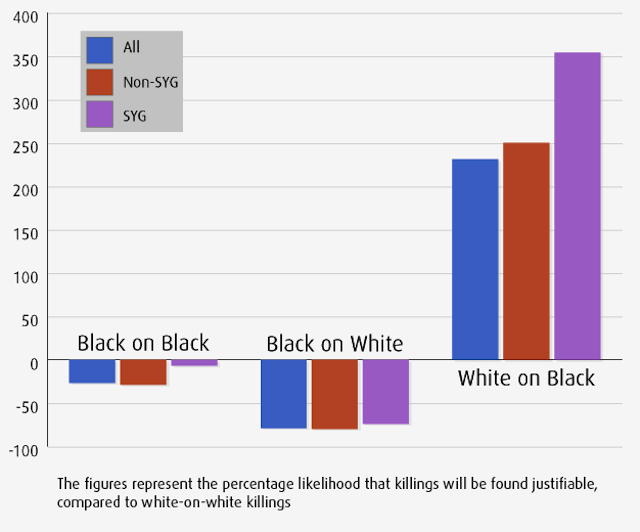 Disturbing chart shows rise in “justified killings” of blacks in U.S.
George Zimmerman has been found not guilty of murdering the unarmed teenager Trayvon Martin in Florida. Many Americans were not shocked. And there’s a good reason why. Hard data shows that recent U.S. laws make it easy for blacks to be gunned down without anyone being found guilty of murder. Last year, PBS Frontline published a fascinating analysis of how murder convictions have been affected by “Stand Your Ground” laws, which expand the reach of self-defense laws that protected Zimmerman. The study was conducted by John Roman, a senior analyst at Urban Institute’s Justice Policy Center who had previously conducted studies on the statistical relationships between race and homicide in the United States. As an interesting aside, it’s worth noting that the Supreme Court of the United States ruled in 1987 that a defendant cannot use statistical evidence in court to prove racial bias when it comes to death sentences. Mull that over as you read. At FRONTLINE’s request, Roman analyzed the pool of 43,500 homicides by race in states with Stand Your Ground laws and those without them. Because he wanted to control for multiple variables — the races of the victim and the shooter, whether they were strangers, whether they involved a firearm and whether the murders were in Stand Your Ground states — Roman used a technique known as regression analysis, which is a statistical tool to analyze the relationship between different pieces of data. Using this analysis, Roman found that a greater number of homicides were found justified in Stand Your Ground states in all racial combinations, a result he believes is because those states yielded more killings overall. Roman also found that Stand Your Ground laws tend to track the existing racial disparities in homicide convictions across the U.S. — with one significant exception: Whites who kill blacks in Stand Your Ground states are far more likely to be found justified in their killings. In non-Stand Your Ground states, whites are 250 percent more likely to be found justified in killing a black person than a white person who kills another white person; in Stand Your Ground states, that number jumps to 354 percent.